In the United States, 4,000 nondisabling and 3,600 disabling electrical contact injuries occur in the workplace annually. A total of 2,000 workers are sent to burn centers with electric burns each year. Most of the burn victims become permanently disabled from their injuries. Typically, the victims’ lives are forever restricted due to sensitivity to cold weather, mobility, or other physical barriers. Every day one person dies from an electrical incident. In order to prevent these types of electrical injuries, Berkeley Lab has a comprehensive Electrical Safety Program (ESP). Implement proactive controls across the spectrum of expected hazards. Educate the lab population about electrical hazards. Promote a vibrant electrical safety culture. Demonstrate compliance to established standards. For a full description of the flow-down of regulatory drivers, click here. 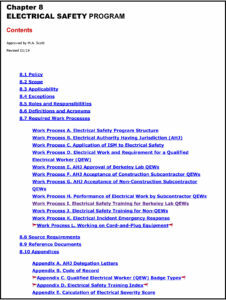 The primary institutional requirements are documented in the ES&H Manual, Chapter 8, Electrical Safety Program. Specific electrical safe work practices, including how to analyze hazards and implement suitable controls, are detailed in the Electrical Safety Manual. Select the icons below for direct access to each document.